Success will be achieved after mastering a few simple commitments while practicing and tracking them daily! Business owners it's time to take control of your business and increase your net worth. Home Biz Books has a system everyone needs to grow and track their business. I've always had an edge or competitive advantage against my opponents. Home Biz Books makes things so easy; I just login into my account, set and forget! Home Biz Books has allowed me to keep track of everything that I do in my business. I encourage anyone who is in business to begin using HBB because it’s so worth it! With countless years of Network Marketing experience, we understand what it takes to be successful. Home Biz Books is the elite system that complies with IRS regulations and proven methods. Our coaches/mentors will be available for live webinars, phone consultations and personal appearances. 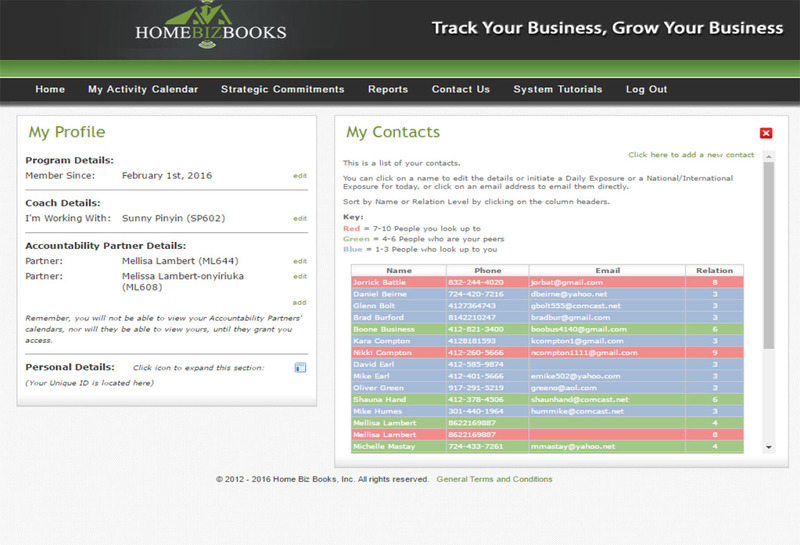 Home Biz Books is the superior tool within the home based business industry for tracking your team’s progress. There is nothing on the market today compares to the power of Home Biz Books. Establishing goals are essential for your business success. With HBB, not only can you enter your goals, you can track and graph your progress as easy as clicking a button. 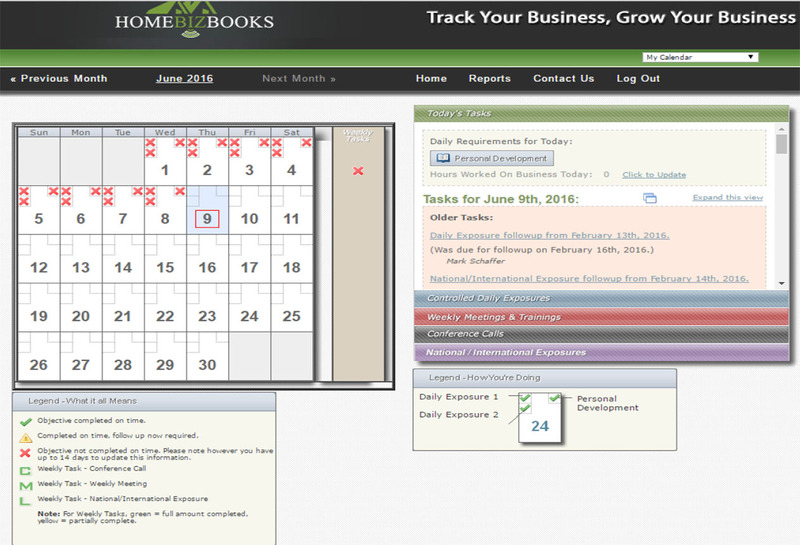 Your “Prospects in Play” are placed on your activities calendar page; it is very easy to visually see the follow up tasks that need to be completed. HBB Personal Development Tracker allows you to enter key information obtained for your personal/professional growth. With our Activity Calendar, each of you will have visual access to your partner’s daily and weekly activities, as well as accountability toward your goals. The HBB system will give you all the daily, weekly and monthly financial reports to track your business. HBB gives you the ability to track your time. Tracking the hours you dedicate to your business is critical to growing your business. The overall balance of your business (profit or loss) is automatically calculated and reports generated as your income is entered. Through the HBB System, you can track their success by cross-referencing the Activities Calendar, there you can visually check their progress and guide them, through accountability. HBB will track your weekly meeting activity, and meeting expenses. The HBB system will allow you to enter vital information for future referencing. As you enter your prospects, the HBB system will automatically display your ratios. It will calculate how many exposures you need to make to sign-up a new team member/customer. This tool gives you the ability to track your daily activities and expenses, while visually seeing and interacting with your team. HBB also provides build in expense calculators for those complex expenses that need calculations. All this built in technology prepares your end of year business financials, for quick and easy IRS Schedule C Tax preparation. HBB reminds you to complete one weekly long distance exposure, tracks it, and alerts you when the follow up is due. The HBB system will track your prospects in play until a final enrollment decision is made. Track you mileage through GPS! Enter expenses and upload business receipts! View your teams Activities Calendar! Text you follow up reminders!